Mullets and mosh pits were the theme last Thursday night at The Newport. 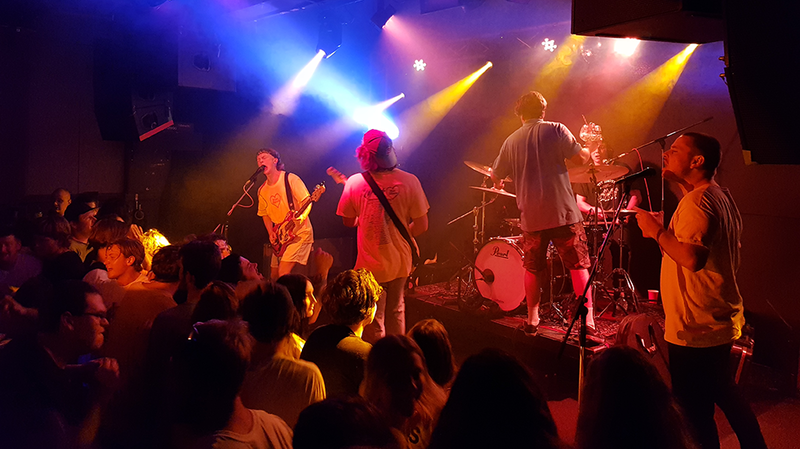 The Chats, best known for the viral film clip for their song Smoko, were in town with equally rambunctious mates Pist Idiots. Calling them viral sensations would be selling them short though, as they had the set to back up the hype. 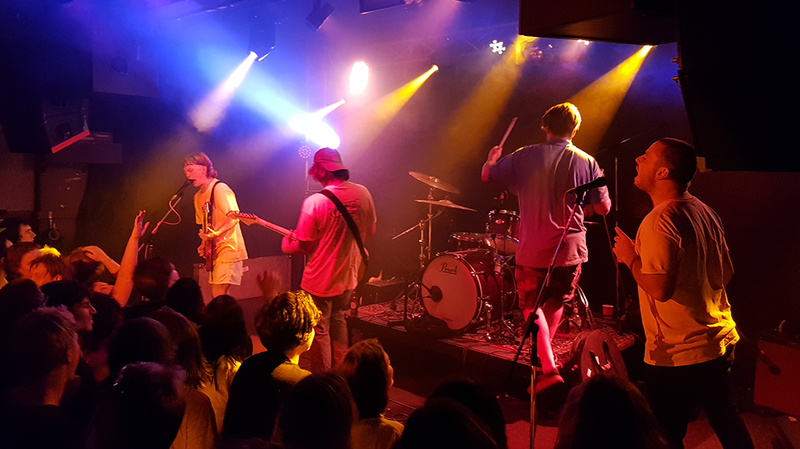 Local faves Hussy kicked off the night. Sadly the room was pretty empty at this stage, but the band still played as if it was full, which is always testament to a good act. The best thing about Hussy is how relatable their lyrics are. Singing about drinking Gatorade in the shower after a big night for example – we’ve all been there. It’s actually such a shame more people weren’t in time to see them. When Pist Idiots got on stage the venue was full. 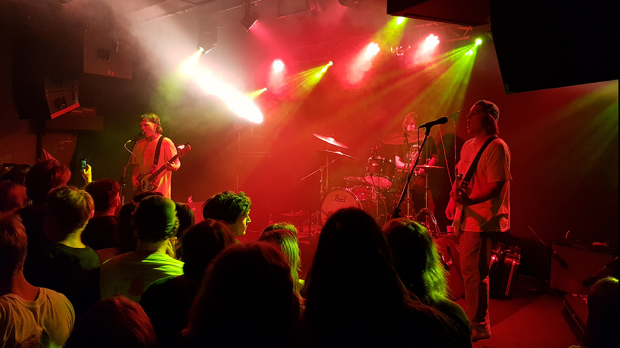 It was hard to tell who amongst the crowd was an ironic bogan and who was straight up, but together they melded into a seething beast of a mosh pit. 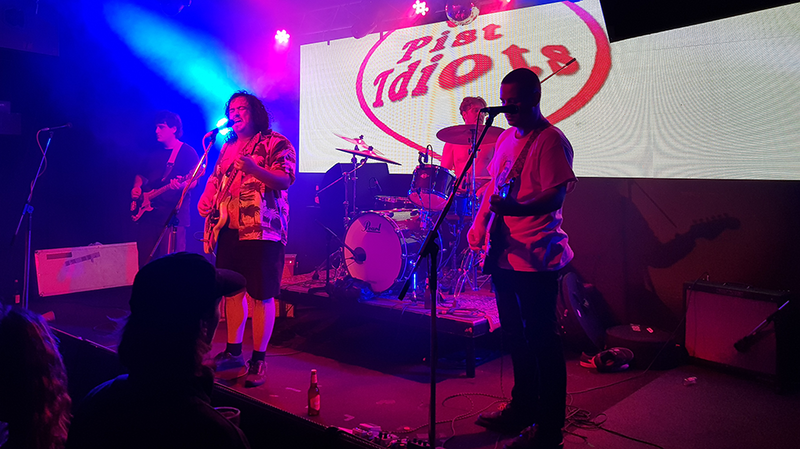 Pist Idiots set began at a scorching pace, however it was their slower songs like F*ck Off that had the crowd holding each other and yelling along. Hair and limbs and shoes were flying everywhere. Despite what looked like an aggressive ‘dance’ floor, there was an overwhelming sense of comradery amongst the patrons and even the bands, with Josh Price (The Chats) approaching the stage and demanding a kiss on the cheek from Tommy Tomato mid song. Also, how good is it when a band doesn’t take itself too seriously? Hitting a bum note, singer Jack Sniff laughed it off and yelled “No apologies!” They wrapped up with the massive singalong 99 Bottles and Price joined them on stage, while people in the audience sprayed their beer over their heads and into the mouths of innocent bystanders. If pub punk wasn’t already a genre, it is now. To set the scene, imagine a heaving crowd of people, half of them wearing speed dealer sunnies (part of The Chats merch), chanting about counter meals, and pushing each other over. As a spectator, it is actually as entertaining as the band. The Chats aren’t long out of high school, and their songs reflect their age. “This song’s about wanking!” they yelled. Their energy is infectious, as was their song about chlamydia, which they prefaced by saying “Hands up if you’ve ever had an STD!” Not to forget How Many Do You Do, about “pingaz”, or I’m The Best Person In The World which is about (surprise) being the best person in the world. It’s all hilarious as heck. When they played Smoko the crowd turned it up to eleven. People were attempting to stage dive and crowd surf, and everyone is toppling over. It’s all well and good until someone gets stuck under someone else’s feet and can’t get up. No one seemed seriously injured, but it’s a good reminder to be excellent to each other and if you see someone fall, pick them back up. Pist Idiots joined The Chats on stage for a cover of Kiss’ I Wanna Rock and Roll All Night before closing out the night with Temperature. People left the show shoeless, sweaty, and satisfied. Except for one guy who, after searching for a while, was reunited with his missing sneaker and was so excited to find it he poured his beer into it, drank it, and slipped it back on. It was possibly the best summation of a riotous night.